XMLType is a system-defined opaque type for handling XML data. It has predefined member functions on it to extract XML nodes and fragments. You can create columns of XMLType and insert XML documents into it. You can also generate XML documents as XMLType instances dynamically using the SYS_XMLGEN and SYS_XMLAGG SQL functions. In this post, I'm sharing a sample ADF application that reads and updates a database table with XMLTYPE column type. My primary objective was to enable the support for XMLTYPE in ADF business components in pure 'Java' way. Let me make it more clear. If you have used Hibernate before, you might have noticed the org.hibernate.usertype.UserType which will help you to add custom data types. Do we have such mechanism in ADF BC to support some unconventional database types which is not directly supported by the framework? Well answer is Yes, however the implementation needs few more extra steps than what you do in Hibernate. Apparently, this post may help you to understand how you can enhance business components to add support for some database table column type which is not directly supported by the framework out of the box. The below section contains the steps that I followed for building this sample. These steps may also help you to understand the hooks offered by ADF Business Components to support new data types. It's fun if you love coding and OK to dirty your hands a bit, stay tuned. Step 1: First step is to know the support offered by your JDBC driver to read XMLType from database. Though there is java.sql.SQLXML type, the JDBC driver that I used for connecting to Oracle database does not implement this type. So I had to settle on oracle.xdb.XMLType, which is an Oracle proprietary extension to read XMLType from database. 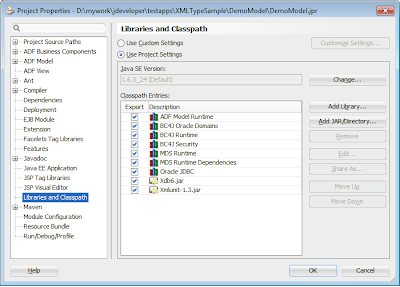 The class oracle.xdb.XMLType is packed in xdb6.jar. Along with this, you may also need xmlparserv2.jar and ojdbc6.jar. Luckily the later two jars come with your ADF runtime by default. The challenge here is grabbing the right version of xdb6.jar that works with JDeveloper. To make your life simple I'm packaging the xdb6.jar in the sample application workspace that I shared at the end of this post. Add the xdb6.jar to the Classpath entries using the Project Properties dialog. Step 2: When you create model project, you might have noticed an option to specify the Data Type map in the very first screen(Initialize Model Project). The business components use this type map entry definitions at runtime to map a Database column type to a java-class type and also to jdbc-sqltype and id. To add support for a new data type, you must extend the appropriate type map entry class to include the new type. Later you can configure the application module to use your class for finding the type mapping entries. The OracleTypeMapEntriesEx class that I'm using for this example look like as follows. To get a real feel of the implementation, you can take look at the source of framework.bc.extension.OracleTypeMapEntriesEx class in the sample work space that is attached at the end of this post(See Download section). You can configure appropriate application module using the Configuration Editor to use this class for identifying right data types while populating the attribute values for business components such as entity object and view object. Set the fully qualified name of this class as value for property jbo.TypeMapEntries in the appropriate bc4j.xcfg file. Step 3: Build a custom Domain object by wrapping the XMLType. For building domain class, you can the New Gallery window and choose the Domain item. See the framework.bc.extension.common.XMLTypeDomain class in the sample workspace to learn more about the custom domain class used in this example. Step 4: Next step is to tell the design time about the new data type that you introduced.This step is optional and not really required for running this example. I just wanted to tell you about this feature. So, feel free to skip this step if you are fine with editing the XML source of business components in order to add new data type for appropriate attributes. Step 5: Generate business components from the database table. Open the entity object which contains the attribute corresponding to the XMLTYPE in the overview editor. Then change the type of the appropriate attribute to the new domain type that you created in Step 3. Go to the source mode of the entity object and change the SQLType and ColumnType manually to point to XMLTYPE as shown here. The above steps are enough to display XMLTYPE from database in your business component browser. Step 7: Build the JSF page with appropriate view object and set the converter from Step 6 for the UI component which displays XMLType content. 1. Create the following table in your HR schema. This example uses ADF_XMLTYPE_CHECK table to check read and update operations on XMLTYPE with ADF. You can copy the following CREATE statement and run it in your database. The same script is also available in the <XMLTypeSample>/lib folder in the sample workspace. xmlunit-1.3.jar (this jar contains XMLUnit class which is used for comparing XML contents in the XMLTypeDomain class) to the class path of the model project. To do this, right click the model project and choose Project Poperties, and then select Libraries and Classpath. You don't need to go anywhere for grabbing these jars. You can find these jars in the sample workspace that is attached in this post, You may find them in the <XMLTypeSample>/lib folder. 3. You are almost done ! Run main.jsf and try inserting records with XML content. Enjoy! Very informative article. Thanks for explaining the XMLType mapping so well. Do you know how to retrieve an XMLType in a custom ApplicationModuleImpl method calling a PL/SQL Function of Procedure? And would the use of a custom Type (not XMLType but some CREATE TYPE sometype (as TABLE OF some other type)) be handled in a similar manner? 1.The model.demo.test.TestXMLType class contains basic JDBC APIs for dealing with XMLType(a very unrefined POJO implementation, still helps to get a feel of API). Any thoughts if any of the above are not compatibale with your solution? Thanks for sharing a good article. This is very interesting and I like this type of article only. I have always read important article like this.